In a thin trading week as the markets prepare for a four day holiday in Europe, the euro vs dollar has traded throughout this week in a relatively narrow trading range attempting to breach both the USD1.35 level and also penetrate the 14 day moving average, but failing on both counts to make any significant impact. 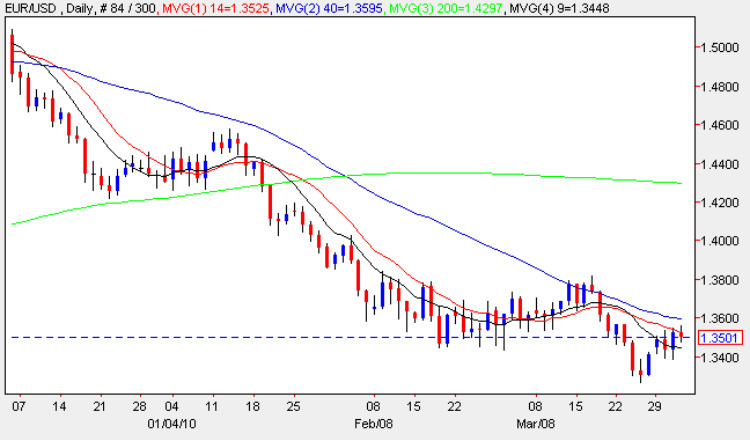 The longer term outlook still remains heavily bearish and with the deep price congestion now immediately above, coupled with the close proximity of both the 14 and 40 day moving averages we can expect to see a further decline in the euro dollar in the medium term. In the short term, and particularly given the upcoming holiday, the next few days will be a mixture of random price moves against the backdrop of further sideways price consolidation. Our medium term forecast still remains a re-test of USD1.30 with USD1.25 possibly representing the floor of the current downwards trend. Into the technical picture tomorrow is, of course, non farm payroll and it was interesting to note that the ADP figures released yesterday came in much worse than expected, and indeed negative at -23k against a forecast of +40k so tomorrow’s NFP data could be significant should this prove to an accurate reflection. The forecast for tomorrow is for a stellar +179k against a previous -36k and should the numbers be anywhere this then the eurodollar could plunge as a result.